Is that old windmill contaminating your drinking water — or a neighbor's? Probably not, but the well below can be. Often, these wells are deteriorating and no longer used, but the well shaft is still a direct connection from the ground surface to the underlying aquifer. This can allow surface runoff to flow directly to the water-bearing zones, often carrying organic wastes, fertilizers, and other chemical residues such as pesticides and petroleum products into the groundwater. Small animals can fall into these wells, further adding to the contamination. Contaminants that enter an old, out-of-service well can migrate to in-service water supplies such as a new well on the property or a neighbor's well. While picturesque, windmills may signal an unused well that can convey surface contaminants to the groundwater supply. Unused wells, especially those that are old and/or in disrepair, or that do not meet current standards as an inactive well, pose a major threat to groundwater quality and represent a serious threat to human health and safety. State law defines these as illegal wells. There are thousands of these wells on farmsteads, acreages, and other rural areas throughout the state. Often, when a new well is drilled, the property owner neglects to properly decommission the old well. Or, even though a well may not have been used for several years, the owner continues to put off having it sealed. Nebraska regulations require that illegal wells be decommissioned by a licensed Nebraska Well Contractor. This process includes removing well equipment (pump, piping, etc), disinfecting, sealing, filling, and capping the well and reporting the work. The cost of decommissioning a well depends on several factors including accessibility, construction technique and materials and well diameter, depth, and condition. Generally this is not particularly expensive. For example, in conjunction with a special water quality educational program in the Shell Creek Watershed in northeast Nebraska, 14 out-of-service domestic and livestock wells were decommissioned in 2005 and 2006 at an average cost of $313 per well. Because of the importance of protecting water quality, nearly every Natural Resources District (NRD) offers an attractive incentive to help well owners with the cost of decommissioning. Payment rates vary by NRD, but typically these programs will pay 60-75% of the costs. With these cost-share payments, out-of-pocket expense to the well owner often will be less than $100 — a small price to pay to help assure that water quality and human safety are protected. If there is an unused well on your property, begin the decommissioning process today. 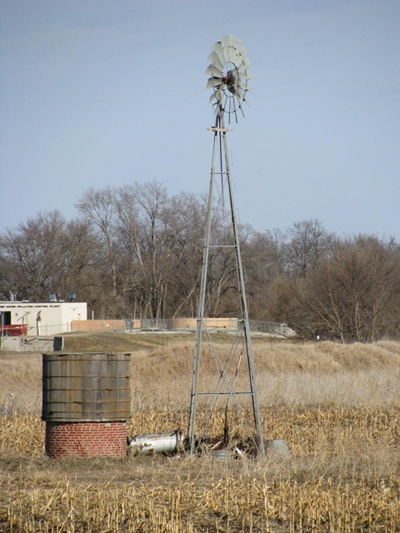 It's okay to keep the windmill for decoration or as a yard light support, but have the well properly sealed and do your part to protect groundwater quality and human health and safety.